In March 2014, West Africa suffered the largest outbreak of the Ebola virus in history. The World Health Organization (WHO) reported over 28,000 cases of Ebola in Guinea, Liberia, and Sierra Leone with 11,000 deaths. Since March 2016, the infection had been contained enough to warrant a downgrade in its status. They WHO later issued an update showing that the major mode of transmission was through direct physical contact with sick individuals; even dead bodies could transmit the infection. It was a cultural practice in some countries to touch and handle the dead, thus amplifying the infection rate. In the lab environments and hospitals, scientists and technicians mitigate or halt transmission through rigorous hygiene protocols. However, human error can always lead to potential cross-contamination or unintended infections. For Ebola, researchers at UT Southwestern used hot sauce to train the staff on biocontamination. Hot sauce was used because contact to eyes, nose, or face would give an immediate response. This clever training regimen has saved lives, but what about other biological of chemical entities? One research group from MIT is working on developing genetically modified bacteria that are impregnated into stretchable materials for biosensing. Xuanhe Zhao, an associate professor of mechanical engineering, and Timothy Lu, an associate professor of biological engineering at MIT, are developing a stretchable, wearable living matrix that would house chemosensitive E. coli that would respond to various stimuli. Lu’s team were responsible for the genetic engineering that would exploit the bacteria’s endogenous quorum sensing, giving an interactive genetic circuit. When the cell is in the presence of a particular molecule, it will induce genetic expression of a reporter molecule. The reporter molecule of choice is green fluorescent protein (GFP), a glowing molecule found in jellyfish. Lu’s team developed a technique where assorted E. coli strains were seeded into channels in a block of hydrogel, the matrix that sustains the cells. Each channel was meant to detect a different chemical agent and when the inducers were applied to the matrix, the associated channel would glow green. This demonstrated the selectivity the cells had to their respective inducers. The response time did vary, with some cells taking up to 5 hours to produce a substantial signal, but cross fluorescence was not seen within the channels. Induction times did vary on matrix thickness. When doing cell-based assays, the bacteria are cultured in a growth media in sterile culture flasks. However, the goal of this project was to embed the bacteria in a growth matrix that would both support and feed the cells. Zhao’s team was responsible for the creating the elastomer-hydrogel that hosted the cells. The hydrogel component held the nutrients the cells needed to live while the elastomer allowed for the material to stretch and flex. The team fabricated the hydrogels by 3D bioprinting and patterned narrow channels to house the bacteria. The hydrogel is porous enough to allow gases and chemicals to diffuse through the system. This diffusion will add to time needed to induce the reporter molecule; thinner sheets can light up instantaneously. To demonstrate their use, the teams made strips of hydrogels that were fashioned into a wearable bracelet. Upon induction, the GFP reporter can be seen by the naked eye. In a more practical demonstration, the researchers fabricated hydrogel finger tips that were layered on a pair of nitrile gloves. After picking up a cotton ball soaked with inducer molecules, the finger tips lit up with swirl patterns. One of the finger tips was used as a negative control and did not light up because its inducer was absent from the cotton ball. This project demonstrated the applications of living sensors that relied on diffusion of signal inducers and chemoselectivity. The team is now addressing the timescale that is needed for induction. Chemical sensing materials can have dozens of applications. 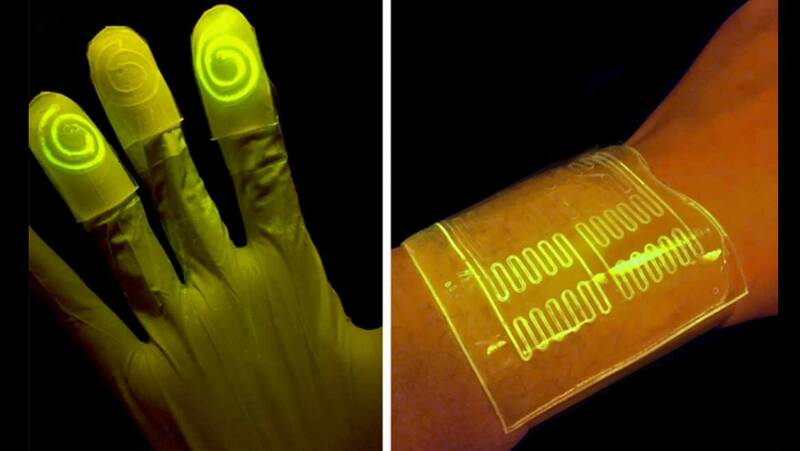 Imagine a bandage that can detect infections by glowing green. Not all the applications need to be in healthcare either. Airline security could use one set of gloves could be used to detect biological pathogens while another set could detect explosive materials. Law enforcement could handle objects or suspects and immediately identify potential narcotics. The GFP reporter molecule can also be attenuated to give other color readouts, blue, cyan, yellow, and red.